Marvel at the local fishermen as they cast their nets into the ocean. Watch as a group of pelicans swarm down over a school of fish. Walk for miles in the warm sun. Splash in the cool, clear waves. Smile as a pod of dolphins swim by, surfing the waves as they go. Listen to the calls of the hundreds of birds who call the area home. Release baby sea turtles, sometimes hundreds at a time. No hotels, no restaurants, no discos... just paradise. There are both beachfront lots and off-beach lots for sale. Underground electricity has been installed in the development, so there are no visible wires impeding your view of either the mountains or the ocean. An underground well provides water to all lots at a minimal cost. The environmental study/permit is included in the price of all lots, which amounts to a considerable savings of both time and money when you decide to build. This is both the best beach in the area and the best value. You will find peace and serenity in the sound of the waves, the fresh ocean breeze, and the beautiful wildlife in the area. Located just 3 miles south of Troncones and 15 miles north of Ixtapa, this is the ideal place for your tranquil beach vacation. There are no vendors and very few people. 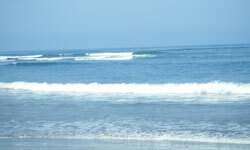 Just sun, sand, abundant wildlife, waves and a nice ocean breeze. Playa Buenavista is at the north end of Playa Pantla. It is a large stretch of sandy beach set alongside coconut palm trees for as far as the eye can see. The area is home to a huge variety of birds and other animals. There is a current project under way that involves sea turtle rescue and support. Keep up to date on the events, news, and happenings on or around Playa Buenavista.